The new Untethered iOS 7.1.X / iOS 7.1.1 / iOS 7.1.2 Jailbreak Tool for iPhone, iPad and iPod Touch devices has been released by Chinese developers called 'Pangu'. The latest available Pangu iOS 7.1.x Jailbreak Tool is fully compatible, supported and working with all Apple iOS Devices running iOS 7.1.X Firmwares. Apple iDevice users can successfully Untethered Jailbreak iOS 7.1.X on iPhone 5S, iPhone 5C, iPhone 5, iPhone 4S, iPhone 4, iPod 5G Touch, iPad Air 5G, iPad 4G, iPad Mini, iPad Mini 2 Retina, iPad 3G and iPad 2G Using Pangu Jailbreak Tool. 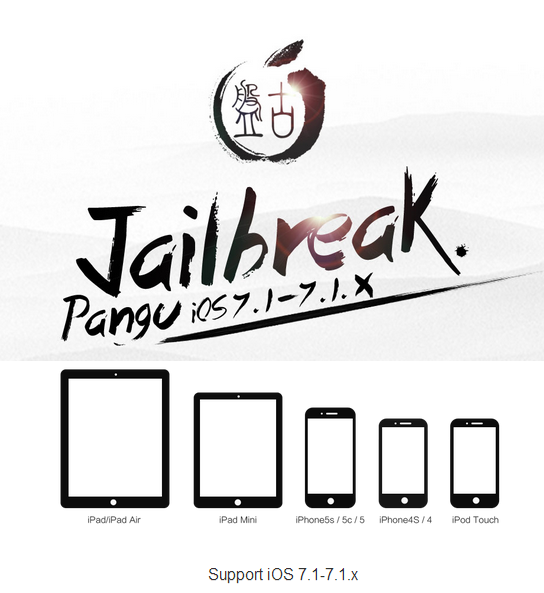 The Direct Download Links of Pangu iOS 7.1.X Untethered Jailbreak for iPhone, iPad and iPod Touch is available for Windows and Mac OS X operating systems below. Currently, following Apple iOS 7.1.X Firmwares are officially compatible and supported by Pangu iOS 7.1.X Untethered Jailbreak Tool. Currently, following Apple iPhone, iPad and iPod Touch devices are officially compatible and supported with Pangu iOS 7.1.X Untethered Jailbreak Tool. Note: Apple iOS users can read full Guide and Tutorial on How to Untethered iOS 7.1.X Jailbreak Using Pangu Jailbreak Tool for iPhone, iPad and iPod Touch HERE.